"At this spot the 77th Infantry Division lost a buddy...."
It may be hard to imagine a time when wars were not covered by 24 hour instant media. With real-time news outlets and the power of the internet, information now travels across the globe and in the hands of millions within seconds. But it wasn't always like that. During World War II, most people back home lived the war through newspapers, radio waves, and personal letters. But who best could tell the story of the common soldier? How would the good folks back home know what their loved ones were facing thousands of miles away? Perhaps someone who lived through their struggles, witnessed their pain, and ultimately... joined them in death. Ernie detested war, but for some ill-strange reason always found himself in its cross-hairs. He felt it was his duty to tell the soldier's story. He had already been covering the war in 1940 in London before the United States had entered. As the war escalated, he would go on to North Africa, Italy, and France. (3) He would be in the trenches with the troops witnessing the carnage as they saw it. Ernie died instantly. He had just looked up for a moment when a bullet, barely missing his helmet, entered his left temple. (1)(2) For three hours, fighting continued before the enemy gun position was finally overtaken. (2) But by then, America had already lost a voice, a compatriot, and a dear friend. Secretary of the Navy, James V. Forrestal announced Ernie's death to his friends backs home. Notable individuals to include President Truman, Army Chief of Staff , Gen. George C. Marshall, Gen. Dwight D. Eisenhower, and Governor Thomas E. Dewey of New York all gave honorable tributes to Ernie and the life he had lived. (1) But no doubt it was the common soldier in the foxholes and trenches that felt the sharp pain of losing a dear friend. Ernie's body was buried with his fellow brothers in a temporary cemetery on Ie Island. 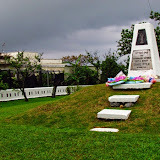 That grave was soon replaced by a monument which continues to stand to this day (see vintage photo). The assistant commander of the 77th Infantry Division, Brig. Gen. Edwin R. Randle, presided over the ceremony and the boys of 77th gave their final farewells. On Ernie's monument they inscribed, "At this spot the 77th Infantry Division lost a buddy, Ernie Pyle”. Ernest Taylor Pyle, August 3, 1900 – April 18, 1945. Places to See Nearby. Yuri Matsuri, Lily Festival (ゆり まつり) - Late April to 1st Week in May, Niyathiya Cave (Senin Gama), Statue of Hando-Gwaa (Mike's Ryukyu Gallery), Ahashagama Cave, Gohezu Cave, Legend of Asato Gura. Directions. 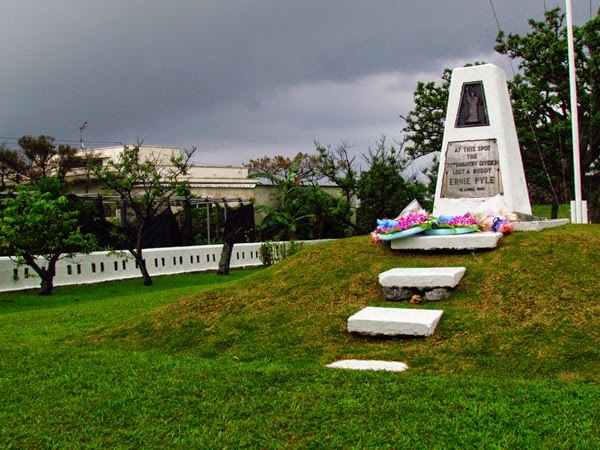 The Ernie Pyle Monument is on Ie Jima Island. Please see article on “Traveling to Ie Jima” for travel preparations. The monument is along Highway 181, about a kilometer west of Ie Port.